We offer loads of help on the essays and on visa application and interview preparation. The Admission Counseling Services team alert the students on the behavior and posture to be maintained during their visit to the embassy. The trainers guided on what to write in each section of the GMAT examination, including Quant (Math), Verbal, Integrated Reasoning and AWA and how to prepare in a relaxed manner. You are given the freedom to be yourself and ask queries with an open mind. Pacing of time and evaluating the right answers within the allotted time space or even less is not the only strategy to be adopted. Critical thinking is applied to eliminate the wrong answer choice. The weakness of the student is given a boost to help them perform better and score the winning 720 plus grade. Scholarships are arranged to ease the burden on the financial front as well. The best B-school admission in most sought after universities the world over. Be confident and ace the examination. You are prepared to go the extra mile with the world class training provided with us. The trainers influence over the student’s intellect is responsible for a big score in GMAT test. You cannot ask for more when the top-end universities are willing to give an enrollment with a scholarship to boot. This boosts the morale of the applicant to make a winning start to his career in MBA education. The flexibility of the classes with weekdays, weekends and one-to-one coaching is another encouraging option, especially for the working professionals. The challenge put before the student’s is dealt with in a skillful way. It is also good to give a serious thought on personalized training, which gives the right focus in achieving what you are aiming for. 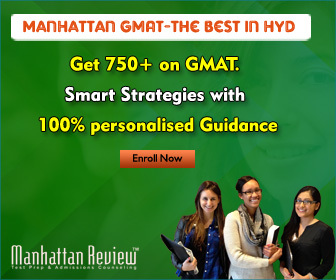 The weakness in logical thinking and significant areas of improvement need to be enhanced to take on the GMAT for successful score of 720 plus. The whole experience is very memorable. Last but not the least, equal interest should be given to diet and mind control and sleep. Work hard towards the process and the rock solid support of the trainers contributes towards a winning score in GMAT preparations. A resourceful course ware, a strong faculty backed with technologically advanced infrastructure is to the student’s advantage. Clear vision with a focus on a winning score is the key to successful entry into top B-schools.